Barefoot with Champagne: DIY Love! I LOVE crafts! Love Love Love them! Ever since I was a little girl I loved doing art projects and creating pretty things. I used to spend hours working on my scrapbooks in elementary school. In middle school I moved on to cool collages mixed with photos and words I snipped from Seventeen magazine. "Hot Stuff!" and "Girlfriends!" were some of the regulars. High school I was into making hemp necklaces and bracelets. I took AP Art in high school where i mostly drew nature in abstract colors. I wasn't the greatest artist but I loved it! One of my best friends, AnneMarie and I were in AP art together and we'd stay in class through lunch hour working on our side projects that we were making for friends. Last year when I was in between having a job and graduating from school I made these photo accordions that are super cute! I even got Antique Garden on campus corner to buy some from me to sell in their store! Antique Garden is one of my absolute favorite stores, one which I will definitely miss if we ever move out of Norman! Lately, I've been working on a few DIY projects for the wedding. I found an amazing wedding blog called StyleMePretty with an entire section dedicated to DIY projects. 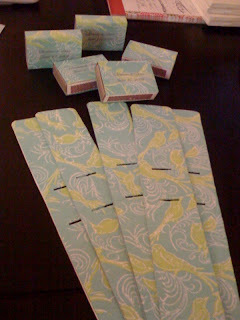 After scouring through every post they had I decided on the matchboxes and sparkler holders to fuel my crafting needs. I think they've turned out perfect! I almost don't want to give them away!